Miraflores is a municipality in the Colombian Department of Boyacá, part of the the subregion of the Lengupá Province. It was founded on 9 December 1811. 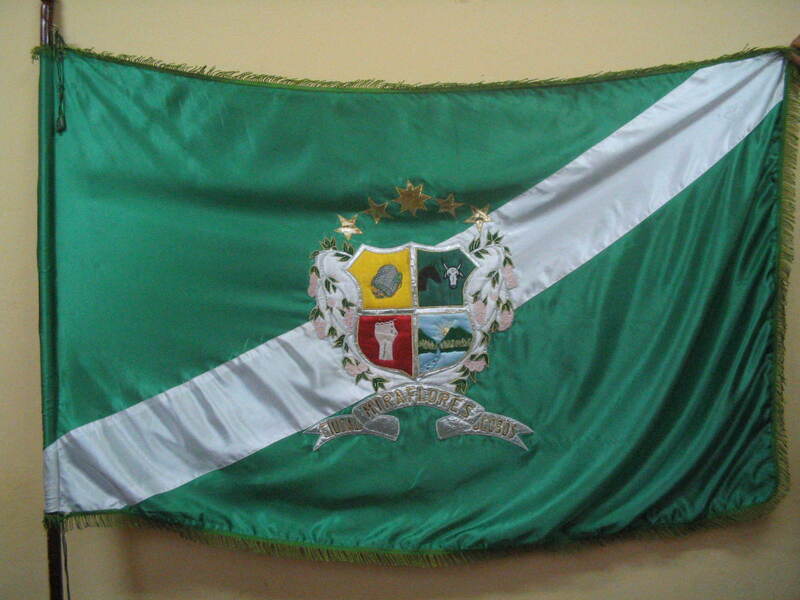 The flag of Miraflores is green with diagonally (bottom hoist to top fly) stripe. In its center, it is charged with the coat of arms and white star. "The colours have the following meaning. Red (50%) represents the fighting and struggling spirit of the inhabitants, as well as blood shed to get freedom. Green (50%) represents the ecological resources and the agricultural potential of the municipality. The white stripe, dividing the flag from the upper left to the lower right corner, has a width of 20% the flag width. The red part represents peace, as obtained and hopefully maintained. The green part represents peace of the natural environment. The star represents the importance of the municipality as provincial capital. Designed by Rosendo Arenas Alfonso". The description clearly does not match the photograph, but refers to the small drawing - flashing versus the coat of arms - shown on the upper right part of the page, a flag horizontally divided red-green with a white descending diagonal charged with something in the middle. "The shield is quartered by a cross argent. I. Or, representing the tropical zone, a basket typically used to pick coffee berries, representing the handicrafts of the municipality, in which coffee, sugar cane, bananas, oranges and other crops are grown; the first quarter therefore symbolizes the fecundity of the region. II. Vert, recalling our grasslands, with a horse's head and a bovine's head [Some 11,000 zebus enjoy the local grasslands. IS], representing the animal breeding resources of the municipality. III. Gules, the arm and hand of a worker raising with energy. Red represents the pugnacity of our people, the fist represents strength, decision and courage of the people of Miraflores. IV. A representation of the Miraflores landscape, with the mountains, belonging to the Eastern Cordillera, river Lengupá emerging from these mountains and refreshing plains and valleys of the same name and crossing the plains of Casanare to flow into river Upía; through the mountains appears a rising sun on the majestuous blue sky, symbolizing hope. Seven stars [or] form a crown above the shield; the biggest [central] star represents the importance of the municipality as the capital of the Province of Lengupá. The six other stars represent our sister municipalities part of the same region, Zetaquira, Rondón, Berbeo, San Eduardo, Páez and Campohermoso. The flanks of the shield are decorated with branches and flowers of "ocobo"**, the symbol of the municipality and a beautiful tree with nice flowers, a source of honour for the inhabitans who grow it. Under the shield is a scroll argent, inscribed with 'MIRAFLORES CIUDAD DE LOS OCOBOS' [Miraflores, Town of the Ocobos]. Designed by Gloria Inés Moreno Camargo." The "ocobo" is Tabebuia rosea (Bertol.) DC., Family Bignoniaceae, also the national tree of El Salvador and the municipal tree of Baranquilla, Colombia. At the web site there is a photo of flowering ocobos in the municipal park of Miraflores. Here again, there are differences between the coat of arms as on the drawing and as it appears on the photograph of the flag. The drawing of the coat of arms shows seven stars, as described, while on the flag there are only five stars, the central one being eight- pointed.